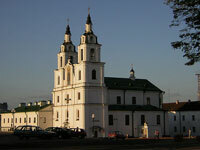 Dating back to the 10th century, Minsk is the capital of Belarus and one of Europe's oldest cities. But it presents a surprisingly modern aspect today, with most of its historic buildings having been flattened during World War II. Minsk was rebuilt as a showpiece Soviet city and little has changed since then. Wide boulevards and squares lined with grandiose block-style buildings along the Svisloch River, interspersed with war memorials and Soviet symbols. There are nightclubs and casinos full of mirrors and lights; restaurants with steel and glass levels; theatres oozing baroque both on and off-stage; and a variety of incredibly themed health spas where waterfalls cascade into indoor pools. The present of Minsk is interesting but so is the past. Because of its central eastern location between Poland and Ukraine, this city has been a European battleground over the centuries, suffering at the hands off the Russian Tsar's troops in the 1600s, Peter the Great and Sweden in the 1700s, Napoleon, and then Hitler.